The bullet that penetrated from underneath his chin, exploding the skull of the 90 year old man may as well have been a bomb, dropped in the centre of Kajo Keji on 19 January 2017. The consequences were immediate and achieved their intended purpose. The old man was a symbolic target by the SPLA forces loyal to president Salva Kiir who had killed this man and five others to ensure fear gripped the hearts of hundreds of thousands of residents of this southern province of South Sudan, bordering northern Uganda. I sat stunned as Bishop Emmanuel Muryi, Bishop of the Episcopal Church of South Sudan (ECSS), Kajo Keji Diocese reverently recounted that fateful day, listing the six people, executed as pawns in a national game of chess where the winner retains power and control of the assets of this dirt poor nation, established in 2011 after generations of civil war with Khartoum to gain independence. He had spoken to each person’s family, consoling them. Bishop Emmanuel continued describing the slaughter. The 32 year old mother of seven: systematically raped by, enduring grotesque obscenities perpetrated on her before being eternally dispatched by bullets riddling her battered and abused body. The intellectually disabled man – an innocent who was mercilessly slain by an assassin’s bullets. The sleeping man, lying on the floor of his house, door open to relieve the stifling heat, mercifully knew nothing of the bullet which left his wife and children without the husband and father who supported them. Two others felt the cold steel of death as bullets penetrated and sapped the life they knew from them. A 90 year old, an intellectually disabled man, a 32 year old mother, a man blissfully asleep and two others. Random acts of violence? Perhaps. More likely people targeted to send a message to this province that the war in South Sudan was now here and their turn had come. If six innocent people can be summarily executed, imagine what will occur to those who may stand up to these butchers. How is he sitting here recounting this horror without emotion I ponder? Is that what trauma does? God’s grace is unfathomable but I still wonder how is this man coping with all this? Consecrated as the third bishop of Kajo Keji Diocese only four days previously on January 15 2017, Bishop Emmanuel was now faced with a similar responsibility to that faced by Moses. Given no notice to gather the Israelites at Pharaoh’s urging the Israelites gathered their flocks and herds and with Pharaoh’s blessing departed. Hundreds of thousands of fear gripped people in Kajo Keji, including the 280,000 Anglican Christians needed decisions to be made. There was no blessing to go, only threats of death. The internal opposition (IO) SPLA members, loyal to Riak Machir the Vice President who control this part of the country made the choice easier by urging people to flee before government troops arrived and continued the violence. They knew the slaughter would continue and they, as I was to see next day were unable to guarantee protection. Bishop Emmanuel gathered his team. Unlike many African bishops and perhaps because he was only four days in the role, his leadership is less hierarchical and more of a consensus style. The decision is made to relocate to northern Uganda along with the hundreds of thousands of others. Not just the individuals but the diocesan office. Plans are made to collect what will assist the functioning of what has become an Anglican diocese in exile. The Christian College trains teachers and church leaders. Books are packed, desks and tables loaded on trucks to enable by God’s grace the ongoing training of individuals. Diocesan records essential to ongoing functioning of the church are prioritised, together with all electronic equipment, including computers which will allow the work to continue. Office desks and chairs join the college furniture. No room for the beds from the college’s hostel where students live during semester. Vehicles are prepared for the drive through the jungle tracks and bikes also loaded onto trucks. The thousands of civilians who flee, leave behind planted crops, food essential for survival in this sustenance farming community as well as their cows and goats. The diocese leaves behind buildings established over generations with the assistance of brothers and sisters worldwide – schools, hospitals, parish buildings and of course the diocesan headquarters. I sit and marvel that here I am sitting in this Bishop’s office in Moyo, Uganda. I had driven into the compound an hour earlier having met the beaming Elly Kajaminyo, Anglican Aid’s long standing South Sudanese contact, now Development Director for Kajo Keji diocese, at the local bus station. He greeted me as a long lost friend. We drove to the Diocese of Kajo Keji (in exile in Uganda) five minutes away. We are greeted by over a dozen staff having morning tea on the long verandah. Several canons, a few reverends and lay staff make up what I came to know as an awesome team. There is 67 year old Canon Henry Leju who established KK Ecumenical Training College in 1999. They developed programs with other churches in income generation, HIV/AIDS awareness and leadership training. These will all be useful in the current situation in the many camps the church seeks to support the many people living there. He hopes to re-establish this training especially leadership in the camps. There is Canon Steven, Director of Education. He will have a big task in assisting the many children from diocesan schools and others continue being educated. There is Golda. Raised an orphan, this vibrant and resilient young woman overcame being a double orphan and raised in an orphanage to eventually gain a degree in economics at Uganda Christian University. She spent two months at Harvard on an international study program which has developed her into a smart woman with lots of ideas. She is the monitoring and evaluation officer. Captain Jonathon Soro, Diocesan Secretary keeps the administrative side of the Bishop’s office functioning. Captain because as I guess correctly he trained at Carlile College in Kenya, a Church Army training college. There are others. All essential to the operations supporting a church with sixty six parishes and over 100 ordained clergy. All smashed and destroyed by senseless violence and internal power struggles by politicians seeking their own gain. Both ‘Christians?’ May God have mercy on them at the final judgement for what they have done. I introduced Elly to Canon Nason Baluku, Director of the Church of Uganda’s Planning, Development and Rehabilitation department which is implementing programs for 90,000 refugees in Rhino Camp two hours west. This was a strategic introduction and Nason immediately recognised Elly as someone he had previously met. Over the two days they shared about people known to them, both being graduates of Uganda Christian University. A great rapport developed. The compound where the church is based is a former orphanage, guesthouse and commercial office. On arrival in Uganda seeking a suitable location, the buildings here were available to rent. As part of the appeal to its supporters seeking US$1,000,000, Anglican Aid noted the modest request for rent for a coordination office for the diocese and guaranteed two years of support. The church now had a home. Incredibly, having commenced the exodus to exile, as opposed to the Israelites’ exodus to the promised land, by February a functional office was established. No further wandering. There was the open plan area where a dozen computers provided a sense of permanency as staff continued their duties albeit in another country. Apart from the bishop, Elly and the Finance Officer had the only other remaining offices. I am shown the building next door. It houses the college. A rough ply wall has been erected to make two classrooms. One classroom houses the library. ‘We could not bring all the books,’ James Lule the principal explains. The library along with many other buildings in South Sudan has been damaged and looted but there is hope that the books left behind may have been spared, having no value. The college ‘employs’ nine staff. I doubt anyone is being paid at present. I am introduced to five of the six teaching students who are in class. I am a distraction to them and leave to allow them to continue their studies. They will be teachers after two years of study. I tell Bishop Emmanuel how impressed I am at their achievements. Setting up in a situation such as this is remarkable. Elly comments how encouraging my comments are. Often, he explains people are not aware of what they have achieved until feedback such as mine is heard. I am encouraged that my words are positively received. The power of simple words of affirmation. The bishop explains the situation in Moyo. There are three refugee camps in which the diocese spends most of its time – Mebeling, Morobo 1 and 2. All brand new camps established in 2017 housing between them nearly 200,000 people. They are forty kms from town on terrible roads. The diocese’s Anglicans however are scattered across a large area west to Rhino camp near Arua which has 90,000 refugees, Bidi Bidi, the second largest camp in the world with 270,000 people and the long settled Adjumani on the other side of the Nile. The needs, as expected are enormous. The greatest need expressed by people in all the camps is education for their children, not food. Trauma counselling to address the spiritual emptiness of so many, again forced to resettle. Food is the most urgent need. Food rations are being reduced from half to quarter distributions monthly. Practically this means that instead of the recommended 25kg of maize per household monthly it is being reduced to 6kgs. Tents for shelter. There are 3,300 families at the internally displaced peoples’ camp in Kajo Keji. I realise the information being provided primarily concerns the people still in South Sudan. Anglican Aid provided 20 tons of maize and 15 tons of beans. I quickly point out we are a small agency with limited resources and cannot be seen in comparison to the major NGOs. Elly tells me not to underestimate the impact a small agency can have. There are no INGOs working outside Juba and no aid is provided outside Juba in areas not controlled by the government. The focus returns to trauma and the need for counselling. Train the trainer programs for people in the camps to understand trauma is urgent. I am told of a man who slashed his wife’s throat, killing her and then cutting his own throat and living. People eating poisonous bush food to end the pain. I discuss the plans for my two days there. A visit to an IDP was included in the schedule sent to me some weeks ago. I express reservations but am quickly assured that there are no safety concerns. None of the staff has claimed refugee status as this would preclude them from visiting South Sudan to provide assistance to those left behind. The agreement is we will travel together in two Kajo Keji cars. The diocese is clearly identified by the signs on each side of the Landcruisers. As our formal meeting concludes Bishop Emmanuel urges people to pray hard for peace. This is a tribal problem. He names the tribes. His is not one of them. Nason offers clothes that his department has access to. Church of Uganda can sort them ready for distribution. A comment is made that this is an act of love that will be particularly appreciated by mothers. We pray and adjourn to lunch before heading to the refugee camps. An hour in the four wheel drive, tossed about by the unkept road with ditches and gutters suitable only for off road vehicles. We see water tankers, having unloaded passing from the other side. Trucks delivering food aid are a common sight. We stop by the Office of Prime Minister’s Office to pay the customary courtesy call. No one is in so we proceed. We arrive at Mebeling and the sight I see is a far cry from a refugee camp in my eyes. The Ugandan government generously prepared land in anticipation of the flood of humanity anticipated. Virgin forest had roads graded so vehicular access was provided. Uganda knows a thing or two about persecution, many having spent years in camps in Sudan and Congo, during Idi Amin’s reign of terror. INGOs have come into do the basics; food, water, health care. The camps cover an area over thirty square kilometres so space is not an issue. Each household is allocated a 20 by 30 metre plot of land to grow food on. The camp, apart from the shelters provided by the UNHCR (which appeared reasonably solid) did not look unlike surrounding villages with their straw covered manyattas. The Ugandan government negotiated with surrounding villages to agree to the establishment of the camps in their area. There was no issue about agreement as everyone benefits. Roads are constructed making transport easier and the cleared camps will be a benefit to locals when the refugees return home. I don’t think many know about Kakuma in Kenya, now in its fourth decade. We visit schools in Mebeling and Morobo 2 as well as the location of the nursery school which is ended for the day. Everyone has been primed for our visits. Children singing and dancing lead us in a procession from where we are greeted to special chairs set up in the shade of one of the classrooms. The romantic notion of Africans sitting under trees to be educated is quickly shattered, as the reality sinks in of sitting in the open under the hot African sun, subject to seasonal rains, flies and other insects and the impracticality of a chalk board hanging off the tree stumps. Kids sit on the ground or in a few cases on rough seating constructed of tree branches. Over four hundred children attend this school Trinity East, staffed by qualified teachers who fled with everyone else. Girls outnumber boys at the four schools visited. The principal talks to us about the need for sheltered classrooms or tents. Educational materials for children are urgently required. Each principal we meet has statistics about the enrolment. At each school meeting a formal welcome and introduction are held. The Bishop and myself are special guests and introduce ourselves last and are invited to speak to each group of children. What to say to children who have been through the horrors. I mention Australia. Some of them have relatives there. Why am I here? I explain Anglican Aid has provided support to the diocese to assist the people in the camps I tell them that God loves them and that many in Australia are praying for them and for South Sudan. I speak about hope and looking forward to God providing for them a better future. At Moroboro 2 Nason attracted the attention of two children who have latched onto his hands and are walking with him. Perhaps the clerical collar spoke to them of kindnesses previously extended by men of the cloth. If the ‘eyes are the window to the soul,’ these eyes are smashed windows depicting suffering souls which have seen things no child should see or experience. Both the boy and girl, in their early teens are mute. Nason slips the teacher 5,000 shillings requesting she ensure books are purchased for these children. The outstanding feature of the two camps is the greenery. Around each temporary shelter are gardens growing in the rich soil, which Nason tells me will grow bananas (his measure of excellent quality land from his knowledge as Farmer of the Year in his province). People are not idle and realise relief will not continue indefinitely. The plot size won’t feed them year-round, but it does ensure some food security. We return to Moyo, stopping for water at a shop which has suddenly grown beyond the owner’s dreams. Luck comments Nason, being in the right place at the right time. Comfortable with assurances given the previous day we set off early for the border. No passport needed here. The Ugandan side had a road which was a road and continued into Kajo Keji before becoming a bush track. I missed the “Welcome to South Sudan” sign at the border staffed by a Ugandan military man, armed with a big rifle attached to a big box of bullets. No problems exiting Uganda. We continue through some lush fields, fully planted with maize. Locals are still here, busy on the land, tending cattle, riding bicycles in the jungle laden with goods which once were carried. We come to an area with a few buildings and need to turn left. The armed civilian stops us. He is SPLA Machir. A conversation ensues with the driver and I pick up the word ”right” and ask what the issue is. As we depart I am told the driver was issued a caution for not staying on the right-hand side of the road. Left in Uganda, right in South Sudan. We laugh furiously at the danger to other vehicles in this “heavily congested” part of the country. We arrive at the District Commissioner’s “office” which is a very generous description of the buildings which house a number of leaders of SPLA Machir who control the affairs of the area. Everyone has a rifle. They don’t look army or even as though they understand why the country is at war. We are seated under a tree on the plastic chairs so common in Africa. The Commissioner’s chair is rolled out. A stock standard office chair which Officeworks sell for about $100. The Commissioner speaks without engaging any eye contact. A killer? Perhaps. Does not want anyone looking into his soul. We are thanked for coming. He is sincere in his utterances. He complains that Juba is restricting foreign aid to IDPs in the area. One convoy was organised but once out of Juba the drivers were arrested and the aid disappeared. “Let God open the windows.” He tells us the church is the only agency to come in and give hope. There are lots of programs needed to assist people here. The government will not accept humanitarian agencies outside Juba. There is a lack of trust of aid agencies. 75% of the aid to arrive has come through the church. The main needs here he says are education, health and relief. There are 17 primary schools and two high school He tells us to go and see for ourselves. Interview anyone and hear for ourselves what is really going on and report it. We finish in prayer led by the bishop. I note the DC’s head bowed and a fervent amen from him as the prayer concludes. We go to Logo IDP Camp thirty minutes from the Commissioner’s Officer. The camp is long and scattered. Makeshift plastic sheeting predominates the housing. Small dwellings made of tree branches and whatever wood is available provide unsteady frames for blue plastic-coated shelters. Hopefully the winds here are not too bad. These will not protect against the heavy downpours during wet season. Conditions here are primitive and far worse than in Uganda. Yet people choose to stay and take the risk as some have farms locally and even some distance away and it is easier to hopefully harvest crops from here than in Uganda. This is one of three IDPs in the area. The only agency supporting them is the American Refugee Council and it is very minimal. We thank them for their time and proceed to Liwolo Model School which has 429 children to P7. 268 girls and 161 boys. Boys are significantly less as the classes go up. The school is spread out across many trees with each class having their own tree providing shelter from the sun and limited protection during the rainy season. We proceed to Idi Amin’s birthplace, a town called Yumbe. Distinctly Muslim we stop at a hotel for lunch. I sit with Bishop Emmanuel. He summarises the support needed. Volunteers with distinct roles are required. Trauma training for camp leaders. Software to assist manage the finances of the diocese. Whatever financial support can be given to provide for the needs of these people. I see now why my visit to South Sudan was important to them. Some things can only be understood from personal experience. I had no intention of writing such a long account of my visits in this area. I remember a psychologist telling me that writing is therapeutic and healing. Have I been traumatised by what I have witnessed? As we parted we left knowing that personal contact would ensure an ongoing relationship and desire as a small agency to do all we can to assist this team led by the remarkable Emmanuel Muryi. Christians do need to pray hard as he says. We need to understand that this is not a battle between flesh and blood, but the principalities and powers are at war. God bless South Sudan and God bless the Diocese of Kajo Keji. I am in Kenya to meet partners delivering drought relief in the north of Kenya near the Ethiopian border. Departing Nairobi at 7am we arrived in the southern town of Isiolo after 1pm. It was clear on driving through the town to our hotel that this was a predominantly Muslim area. Men wearing taqiyahs and women dressed in niqabs, burqas and shawls and shops bearing names such as Bismallah were a giveaway. We checked into our hotel ready for a start early tomorrow to view food distribution to people severely affected by the drought. The Bomen Hotel is a better standard hotel in rural Kenya. Something like a one star back home in Australia. I had struggled with whether to take the toilet paper from the guesthouse in Nairobi before leaving but luckily this hotel supplied it. The room is sparse. Apart from a double bed together with mosquito net it had a bench on which I could place my bag. And a toilet and a shower which might supply water with the chill taken off it. We went to lunch and met the Anglican Diocesan Secretary, Hussein who is coordinating the drought relief. A fascinating man who was schooled in Islam for six years but after three years of reading the Bible so he could explain it to others he became convinced of the claims of the Bible, supported by parts of the Quran that Jesus is God. His expulsion from home and the burning of everything by his family left him homeless and penniless. The local Anglican Church would not accept his change and provided no support. He told his story to the principal of the local boarding school and asked if he could sleep at the school. The principal told him what he was doing was silly as there was no God, but yes he would provide a bed if he renounced his new found faith. Unwilling to do so he left not sure what he would do. Rejected by his family and the Muslim community, the local church and now the atheist principal life looked uncertain. The security guard at the school located him and told him to come see the principal. Not sure why, he turned up and was offered a bed and bedding in the students quarters. He asked to be able to enroll in high school and after guaranteeing that God would provide his fees, the skeptical headmaster demanded to know the date when God would pay the fees. His reply was he could not name the date but knew God would honour the debt. Throughout four years of school, he was reminded of the increasing debt and assured the principal that God would pay it. Towards the end of his fourth and final year, the government announced a program to provide debt relief to all high school students and he applied. He personally took the receipt to show the unimpressed principal who announced he was just lucky! The discussion moved to the local area. Twenty people died last week in ethnic conflict believed to relate to the upcoming elections in August 2017. This is sufficient to cancel any visits off the main road for famine relief distribution tomorrow. All people will need to journey by foot to centres near the main road for our safety. Apparently candidates have no ideology, voting is on tribal and ethnic lines. Following the 2007 elections which saw violence never experienced in Kenya previously, the two major “parties” have joined forces almost guaranteeing the result with the President and Vice President from the differing coalition parties. There are 14 ethnic and language groups in Marsabit and it seems last week’s violence is designed to scare off the ethnic group which may pose a threat to the perpetrators party not to turn up on polling day. This is a well known tactic across Kenya ccording to those who accompanied me from Nairobi. It is not unusual in Africa to be accosted by people selling trinkets, clothes, souvenirs and other things of interest to visitors. The man who came to approached us had a range of knives which he pulled out which looked serious in a Crocodile Dundee sort of way. Particlarly dangerous was the baton, which when you pulled at one end revealed a small sword about 30cm long. When latched on to the weapon it looked doubly dangerous. $6 for a Bowie style knife which if plunged would make mincemeat of you. Knives it seems are not the only weapons available to locals. Many guns are available and make their way here from Somalia, bypassing police checkpoints enroute to Nairobi and other areas where mischief is planned. Apparently some of the bandits even have rocket launchers. This led Hussein to talk about the people he personally knows who have gone to Somalia for training as suicide bombers. Somalia is accessible by road being next to Ethiopia. These Muslims go there based on the logic of being received into paradise if they kill kaffirs. This explains the extraordinary security at All Saints Cathedral in Nairobi yesterday where I was checked by guards with scanners three times. The threat is not just in the cities of Europe, USA and Australia but also in the towns and cities in Kenya. Cattle rusting is a major crime and there is a valley north of here where the police and army no longer venture, so many of them having been killed by locals who know the valley very well. So the challenges here are significant. The drive north revealed a country gradually developing as the road to here is now all sealed. Building development was obvious on the highway north and it appears Kenya is developing economically, no longer being listed a developing country but middle income. At All Saints Cathedral yesterday, it was impressive to see that this one church had sent over US$13,000 to six drought affected communities in the north. Not a lot compared to what my agency has contributed, but a huge amount relative to the incomes of the people here. 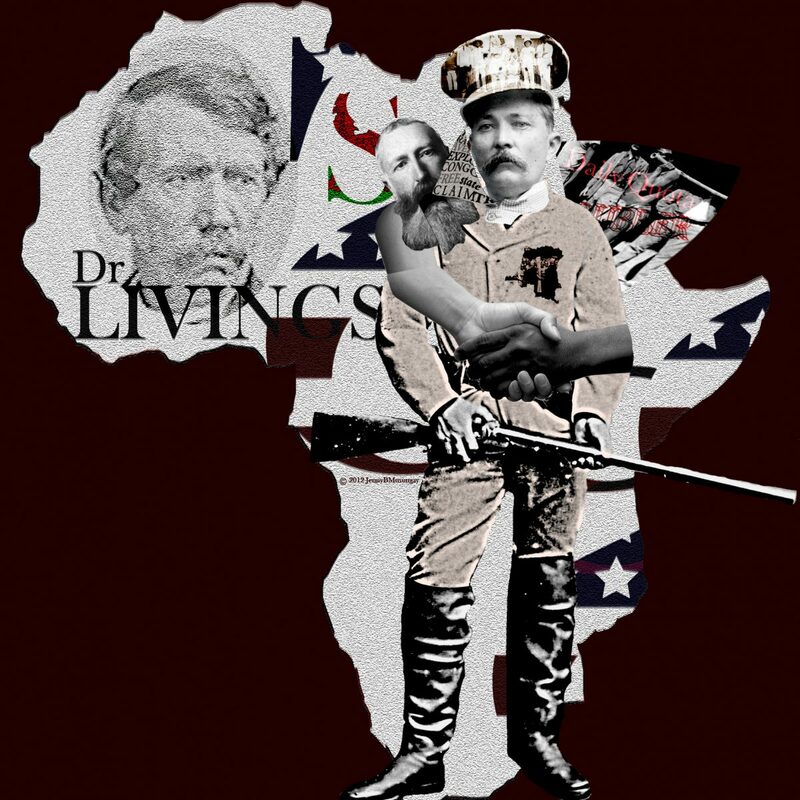 Stanley, despite his extraordinary feats in opening up Africa was not treated well by history. Some of this was of his own making as he was literally a mystery man who made his way as a waif out of a workhouse to become the most famous explorer in Africa as well as the Middle East and India under the guise of an American reporter. He did serve in the American Civil War on both sides so he was a unique man. He is slowly being rehabilitated as historical documents available in recent years show him as someone who was exploited by the Belgium King Leopold. History has shown Leopold to possibly be the most brutal colonist in history. Bula Matari is also a book Leadership and Authority: Bula Matari and Life-Community Ecclesiology in Congo written by Titre Ande, a Bishop in the Church of Congo. He uses the term to describe the way the Congolese church has inherited western and colonial understanding of power which are not consistent with African culture. Ande has a doctorate and we met in 2014 when I visited the Congo as part of my employment. I was astounded at his humility and kindness as I spent three days visiting him and understanding his diocese and the work being done. I read the book subsequently and was impressed that he was calling the Congolese Church to practice what he not only preached in his book but how he acted as Bishop in his diocese. My life has been rich and full. It was dramatically changed in 1976 when I was 21 years old by meeting Jesus and establishing a relationship with him. The changes which ensued affected all aspects of my life including who I would marry, my employment and how I would live. For example my focus shifted from accumulating wealth to serving the poor. Blogging will reflect many aspects of changes I have experienced and the situations I have been placed in as a result of my relationship with Jesus. Just as Stanley fought incredible challenges to overcome the inhospitable terrain of Africa to achieve his purposes and as Titre Ande has challenged the Congolese church, I trust this blog will break modern day cultural rocks held dear by many who are challenging society and the church. Aru Diocese DRC starts the day with prayers across all organisations and ministries. bulamatariblog Create a free website or blog at WordPress.com.